I’m in awe of the amazing courage of those who battle breast cancer. I’m also in awe of the friends and family who support them through it (often in the form of a casserole or well-timed milkshake). My friend Susan Shofner fought her battle and continues to win it every day as a 18-year breast cancer survivor. Susan was kind enough to share what she learned. We hope it will help you — whether you’re the one faced with a diagnosis or the one holding her hand. What scared you the most when you were diagnosed? The unknown. Once I had knowledge and understood my options, it eased my fear. Now don’t get me wrong, there were nights that I would go down the rabbit hole, but knowledge is what kept me on solid ground. How did you push through the fear? When fears would pop up, I shared them with my family and friends. I found that once I talked about them, it took the power away. If I kept it rolling around in my head, all of a sudden I was dealing with a monster. I also kept a gratitude journal. There were days the only thing I was grateful for was my bed and the milkshake delivered by a friend. Just being aware of what I had to be grateful for helped keep me out of that rabbit hole. What do you do differently now? I act as my own wellness advocate. I found the lump in my breast and went to several appointments with doctors, including a mammogram. Each time the response was, “It doesn’t have the characteristics of cancer and you don’t need to worry about it.” But I listened to my body. It was telling me that something wasn’t right. So I pushed for a biopsy. That’s how we discovered it was cancer. Having cancer taught me to slow down and take care of my immune system. When I start pushing too hard, I can feel myself sliding into a frantic state. I know that state is not good for my body. So I learned to ask for help. I can’t do it all, all of the time. I am so blessed to have amazing friends that are there for me when I need them and vice versa. I have also learned to breathe deeper, have more silence in my days, really count my blessings and pay closer attention to nature. What’s the best way to help someone fighting breast cancer? Keep asking, “Do you need anything?” Even though my initial response was usually no, the friends who showed up with a hot meal or came over and cleaned my house were lifesavers. Women have a hard time asking for help and receiving it. Having someone water your plants or do the laundry are true blessings. Don’t forget them several months into treatment. Traditional treatment can go on for six to 12 months and more. Don’t forget a card, phone call, or a quick hug down the “treatment” road. Try to withhold advice unless you’re asked specifically for it. Suggestions like start juicing, go vegetarian, go to this doctor a friend of mine saw, etc., etc., can be really overwhelming. If a loved one asks for additional information and guidance, fine. It is hard enough staying focused and learning as much as you can from your treating medical team. Also, try not to judge the person for their method of treatment. Each one of us deals with cancer in our own way and has to find the treatment that feels right for us. We just need to support each other in any way we can. How did you decide on your course of treatment? My brother and I read everything we could about breast cancer. Then I took what rang true to me and made that my game plan. I sought several opinions and put together a great wellness team. The love of my family and friends. I’ve been a Jazzercise instructor for 33 years. The prayers and energy sent from fellow Jazzercise instructors all over the country and the support system of my local Jazzercise village were invaluable. It is so important to create and belong to a support system. My heart breaks for those who go through a thing like cancer alone. Do you think about it every day? I think about it when I have a nagging pain or a cough that hangs on too long. That’s why I have a great wellness team. I have my wonderful team at Function First who keeps my body in alignment and out of pain and my medical doctors who are on it when I come into their office worried. Just thinking back on that time of my life brings back so many emotions. And at the same time, it almost feels like I am talking about someone else — that it wasn’t me. How did fighting breast cancer change you? What I decided to do is give back to others dealing with breast cancer. For 10 years I’ve worked to raise funds and awareness in hopes that one day there will be a cure! 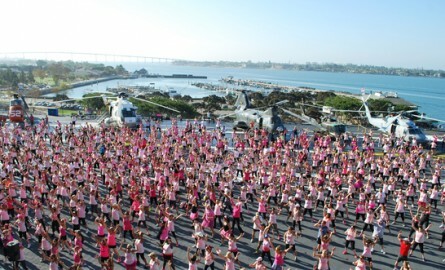 On September 13th here in San Diego, Jazzercise instructors led an 1,100-person group fitness class on the decks of the USS Midway to honor breast cancer survivors, increase awareness and raise funds to find a cure. 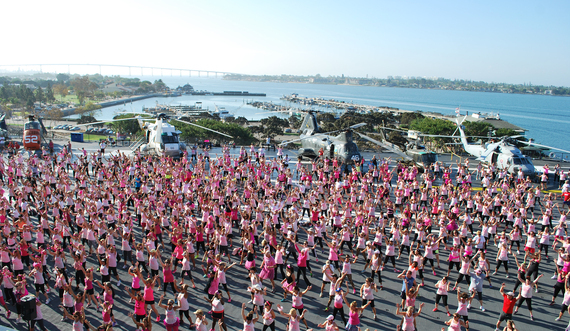 We raised more than $91,500 for the Susan G. Komen 3-Day! What can we do to find a cure? Today in the United States there are more than 2.8 million breast cancer survivors and about 232,670 new cases of invasive breast cancer will be diagnosed in women, according to research from the American Cancer Society. Organizations including the American Cancer Society, Susan G. Komen and Breastcancer.org offer resources and ways to help. Our hearts go out to everyone affected by breast cancer. If you’ve been through it and have advice you’d like to share, please comment. Judi Sheppard Missett, who turned her love of jazz dance into a worldwide dance exercise phenomenon, founded the Jazzercise dance fitness program in 1969. The workout program, which offers a fusion of jazz dance, resistance training, Pilates, yoga, and cardio box movements, has positively affected millions of people worldwide. The international franchise business hosts a network of 7,800 instructors teaching more than 32,000 classes weekly in 32 countries. For more information, visit jazzercise.com. By Katie Sola Interested in trying a standing desk but put off by the price? Check this out.